Our Highland Brigandine was inspired from the screen worn costume in the movie Braveheart. Our Highland Medieval Brigandine Suede Leather garment has Leather plates riveted between the outer shell and the lining. This kind of construction made it easy enough for a soldier to make and repair his own armor without needing the high skill of an armorer. Weighing only 15 lbs. it is very flexible and does not restrict movement. Approx. 35 inches long. 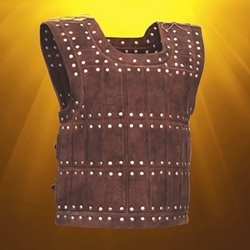 Commonly worn over a gambeson and mail shirt, it was not long before this form of protection was in wide use with fighters from knight to archer. Our version has two buckles as shown for great versatility in fit.